I’m running Zimbra Mail Server on openSUSE since last 2 years. I’m quite satisfied with the great features on Zimbra but I lost one nice feature as included on my old MDaemon Mail Server while still using Windows on 2003-2005. It was an Archival Feature. One of the important features that are needed on a mail server is archiving, the backup copy of all incoming and outgoing mail. Although we can do the backup process periodically for every account, archiving more better and efficient because we have all of copy email which 100% similar with the original. I’m writing a simple tutorial and it’s impact in my personal blog. Click here to go to the article. 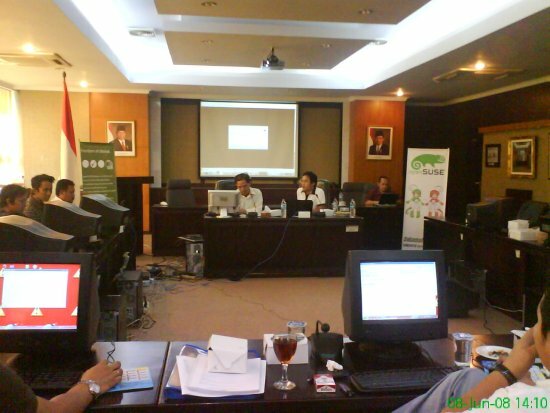 Indonesian openSUSE community website built on July 23, 2007 and serve as the first place for discussion, finding tutorial and supporting openSUSE fans. 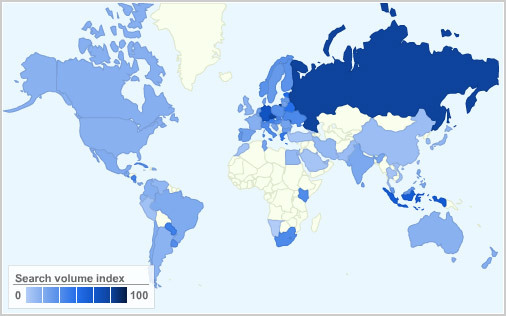 Google PageRank trend is consistent with the increase in the number of users of openSUSE (user who install openSUSE in their PC or laptop) in Indonesia and in tune with the increasing number of forums and mailing lists user. It’s also consistent with the frequency of users who accessing the page tutorial on website. Hopefully PR 6 can be the extra spirit to continue the improvement of the openSUSE community in Indonesia. We hope to provide best support for users of openSUSE and it’s variants distro. Our next project is increasing tutorial page and encourage the member to create their personal blog within openSUSE blogger community. We hope to see more and more openSUSE related articles, with English or Indonesian or another language. openSUSE Board Elections phase 1 will be finally over at 1200 UTC on 09 October 2008. I’m quite silent with the elections discussion on openSUSE mailing list (marketing, project and another mailing list) due to my job, my project in Indonesian openSUSE community and due to Happy Eid Mubarak holiday here in Indonesia, but as openSUSE lovely user, I will vote for somebody who will be stand for openSUSE board, as our (or me as openSUSE user) gateway between community and Novell. I’m really appreciated for everyone who take the opportunity as openSUSE board candidate. It should be a great job. All of openSUSE board candidate have technical or supporting background, active in the community and show their great effort and participation in the past. One of openSUSE board candidate is Pascal Bleser (well known as yaloki on IRC). I have a nice discussion by IRC and by mail with him and get a good response. He is an incumbent of openSUSE board, means that he was currently openSUSE board member with AJ, Coolo, Federico and Francis. 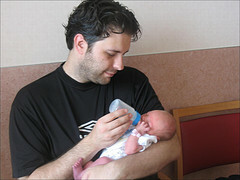 I know he has good technically background (describing zypper stuff for about 1 hour 😛 ), active on FOSDEM, good dad for his baby (look at the photos 😀 ) and don’t forget, he has been actively on merging and joining Packman repositories for openSUSE. I don’t see any reason why I could not choose him as openSUSE member for next period. With his experience as first openSUSE board member; his technically background; his connection to another person in various open source project; and his good position to understand relation between Novell and the community, he would be the best choice for next openSUSE member. Vote and campaign for Pascal Bleser as openSUSE Board member ! openSUSE 11.0 failed detect this hardware and wrong identifying the device as AR242x 802.11abg Wireless PCI Express Adapter. I usually uses madwifi driver for Atheros chipset instead of ath5k but the standard madwifi driver could not be applied for the device. After Googling for a while, I could make it works with the special AR 5007 EG madwifi driver, http://snapshots.madwifi.org/special/madwifi-ng-r2756+ar5007.tar.gz. How to make it works ? 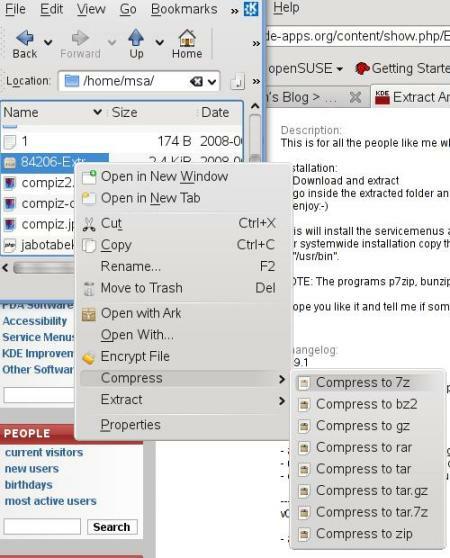 One of the functional menu that make my life more easier with KDE 3 are the Compress and Extract Menu. With this function, I could make an archive or extract zip file with Konqueror without opening Ark for manually extract or compress the file. Now, I enjoy the KDE 4 on openSUSE 11.0, with Kwin desktop effect and a lot improvement in various area, but I still missing the above menu. The above tips will make a system wide configuration. If you wish to make a local changes, just execute INSTALL_1.0.sh on the extract folder. NOTE : The programs p7zip, bunzip2, bzip2, gzip, rar, unrar, tar, zip and unzip must be installed. Welcome to the Official openSUSE Forums ! 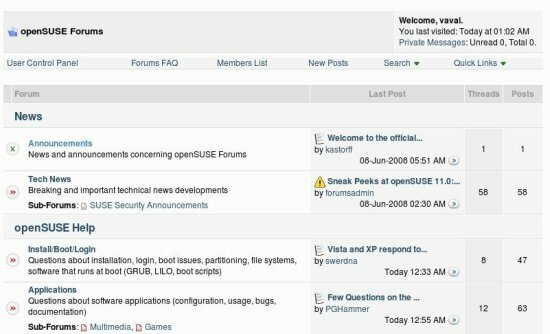 After announced on March 11, 2008, official openSUSE forums has been established and starting work for providing better support for openSUSE community on June 09, 2008. Forums merges 3 existing openSUSE forums, suseforums.net, suselinuxsupport.de and the openSUSE support forums at forums.novell.com. You could use single sign-on login with your Novell/openSUSE account. It’s also should be work with your existing account at existing forums but I didn’t try it ;-), so, please try to login before create another new account.